Prac­tic­ing Shostakovich this week, along with his comrade-in-angst Mieczys­law Weinberg, for a concert with ACME. I haven’t much thought about Shostakovich’s musical language since sopho­more year of high school, when my attrac­tions tended toward the loud, the disso­nant, the minor-mode. Shostakovich symphonies were just the ticket. One of the first great myster­ies of writing music was, for me, just this—how to stuff a piece so it wasn’t just a theme, repeated a few times. What was all that musical caulk filling in the gaps? What do you do after you’ve stated your theme (and restated it, in Weinberg’s case)? 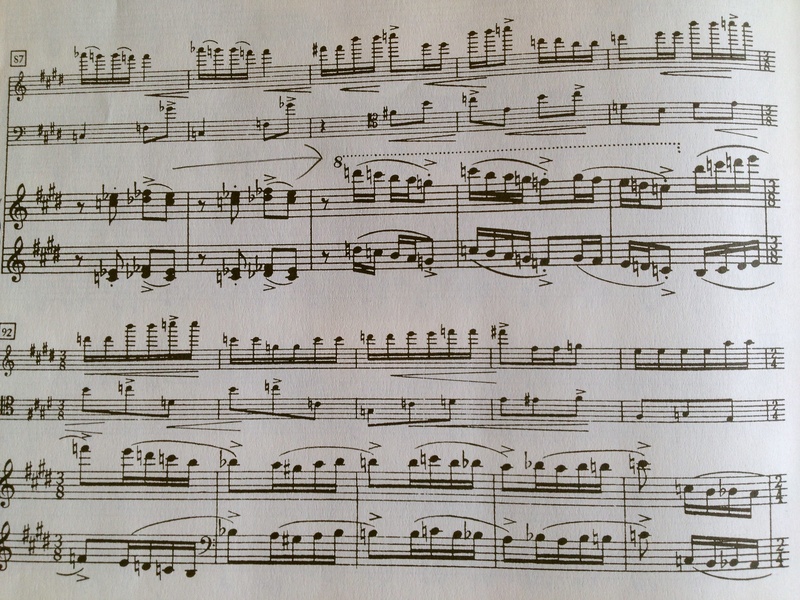 It’s still kind of a mystery to me, what fills in the gaps in Shostakovich. We’re told the stuff is somehow “political”—that it’s purposely banal, or ironic—saying lots of words and meaning the total opposite. How to convey that in a perfor­mance, though? Power­less as music is to commu­ni­cate a concrete thought, is it even worth trying? Maybe the best I can hope for is to shout “Loud, Disso­nant, Minor”, and the rest will take care of itself. Loved the concert last night, thank you for expend­ing my horizons on clas­si­cal music. As a Viennese ‘woman of a certain age’ pretty well grounded in clas­si­cal music, whenever I attend a ACME or ICE concert I am astounded by how little I really know. To be exposed to composers like those last night, as well as contem­po­rary composers like yourself is a real treat and I always approach each perfor­mance with great antic­i­pa­tion. Keep up the good work, look forward to our next outing! Your perfor­mance of the Philip Glass last night (12 May 2013) at the Barbican in London was stupen­dous. The treat of having you, Nico Muhly and Philip Glass all playing Philip Glass left me thrilled beyond words. The group around me agreed that you played Glass better than Glass which is rather unbe­liev­able and must have been a thrill for Philip Glass himself. Bravo. The only really trivia thing that let you down was your suit, Nowhere as good as your perfor­mance. Might I suggest a trip to Savile Row, the next time you are in London Have them watch you play in the suit you wore last night and they will give you the look that will match your wonder­ful playing. You were bril­liant. BRAVO. Thanks, Eric! Glad you enjoyed. It was indeed quite a thrill. I’ll probably post some sort of trav­el­ogue about the rest of my London trip shortly. If only one could afford to go to Savile Row…maybe next trip! I do have a very good tailor back home in Brooklyn, though he did not make the suit I was wearing the other night.